and numerous other issues related to separation between husband and wife. In the same way there are many other contentions relating to judicial issues, for all of which, it is extremely necessary to have a Qadi (Muslim Justice) in authority. It is thus necessary for every city, district, province and country to have a Muslim Justice (Religious Judge) in authority, so that the affairs of the Muslims may be properly settled. Where there is a Sovereign Muslim State, it is the responsibility of the Sovereign Righteous Muslim Ruler (Sultaanul Islam) to appoint the Qadhi and where there is no Sovereign Muslim State, then the most knowledgeable amongst the Ulama-e-Deen is regarded, by the being appointed by the Will of Allah, as the Qadhi and the one responsible for the administration of the general appointment of leadership responsibilities and the judicial affairs of the Muslims. It is he who is as being appointed from the Divine Court of Allah as the Islamic leader, the Guardian of the Religion of Islam and the Muslim Justice in authority. It becomes Waajib (compulsory) upon the Muslims to turn towards him in order to resolve their religious and other issues. In the situation where there is no Sultaanul Islam (Sovereign Righteous Muslim Ruler), the administration and management of appointment is the responsibility of the Ulama and their aides. It becomes their responsibility to appoint the most knowledgeable Aalim as the Qadhi of their affairs. It is the responsibility of the Ulama and their aides of a district to appoint a Qadhi for their district. Likewise it is the responsibility of the Ulama and their aides to appoint a Qaazi for their respective provinces, whilst it is the responsibility of the Ulama and the aides on the entire country to appoint the “Qadhi al-Qudha” (Chief Justice) for the entire country. In a case where the Ulama and the aides are negligent and apathetic in the issues of managing the said responsibility, then the general (Muslim) public may together mutually agree on appointing a Qadhi for the reason of deciding their religious cases and affairs. Now, if both the general public and the responsible members of the community are negligent of this responsibility, then the most knowledgeable amongst the Ulama, as per the Will of Allah, will be regarded as the Qadhi and it will be become necessary upon the Muslims to turn towards him for their religious affairs. The most knowledgeable amongst the Ulama in the country is made the Qadhi of his city and his jurisdiction and authority is his city including the nearest and furthest areas of (the city) and all its suburbs. The authority of the most knowledgeable Aalim of a district is his district. The authority of the most knowledgeable Aalim of a state is his entire state, whereas the authority and jurisdiction of the most knowledgeable amongst all the Ulama in the country is in different cities, towns and states through the agreement of the Ulama and aides of the numerous cities, towns and states, for the administration of (affairs) and actually (he) has authority over the entire country. After presenting the above detailed discussion, it must be said that both the general Muslim masses and the special servants amongst the Muslims know well that the Markaz (Centre) of the Ahle Sunnat is “Bareilly Shareef”, from where for more than two hundred years the responsibility of guiding the Muslims in their religious and social affairs is being fulfilled. It is the result of this exceptionally given direction and Judicial masterfulness, that the entire Ahle Sunnat wa Jama’at has recognized Bareilly Shareef as the Markaz. Imam Ahmed Raza appointed as the Qadhi: The personality of the Mujaddid (Reformer) of the 14th Century Hijri, Mujaddid-e-Azam, Imam-e-Ahle Sunnat Imam Ahmed Raza (Alaihir Rahmah) needs no introduction. This is that unique personality of the era, an Emperor of Hanafi Fiqh, who was the most knowledgeable personality in the country. On the basis of his vast knowledge and mastery in Islamic Jurisprudence, A'la Hadrat (Alaihir Rahmah) was appointed as the Chief Justice of the entire undivided India by the Will of Allah. He was the central figure of the entire Muslims masses and the Ulama of India. All turned to him for religious decrees. Mufti Azam Hind as the Qadhi: Imam Ahmed Raza (Alaihir Rahmah) then appointed his beloved student (and son) Mufti-e-A'zam Mufti Mohammed Mustafa Raza Qadri and his chosen student and Khalifa, Sadrush Shari'ah, Allama Mufti Mohammed Amjad Ali Razvi, as the Chief Justices of the entire India, just as it was mentioned in detail and presented in numerous composition on moon sighting, during the second seminar on Islamic Jurisprudence hosted by “Shar'i Council of India”. Then, Mufti-e-Azam Hind (Alaihir Rahmah) appointed Taajush Shari'ah his true successor and spiritual heir handing him authority over all his religious affairs such as in the field of issuing decrees and in Judicial matters and at the same time granted him authority over all his spiritual affairs. In other words, Taajush Shari'ah is actually the Chief Justice of the entire India. It is for this reason that in Bareilly Shareef, the general Muslim masses and the Ulama turn towards him for advice in appointment of Imam and Khatib for the Jum'uah and both 'Ids and for the announcement of moon sighting confirmations and all other issues related to Jurisprudence and decrees. He in turn fulfills this great responsibility. Due to his vast knowledge and his masterful ability in Jurisprudence, his has been been appointed by the Will of Allah azza wajal for the leadership and the responsibility of Qadhi. The entire India accepts him as the one to turn towards in issues of judiciary and religious decrees. 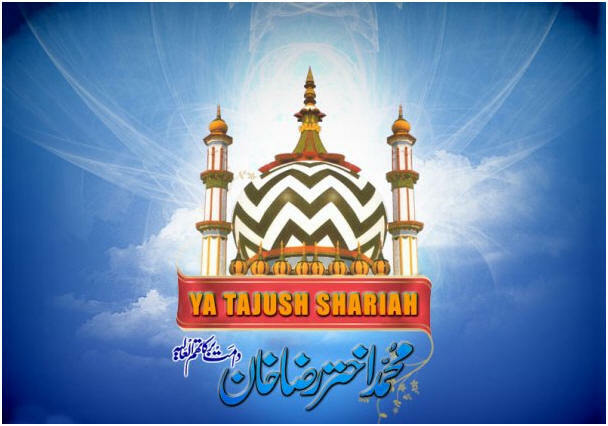 During the Urs-e-Razvi, in an audience of hundreds of thousands of people, and in the presence of scores of learned Ulama and other religious dignitaries, Muhaddith-e-Kabeer, Hadrat Allama Mufti Zia ul Mustafa Qadri Amjadi Qibla, announced Taajush Shar'iah as the Chief Justice of India as appointed through the Will of Allah. All the Ulama and Muslim masses present during this massive gathering immediately and whole-heartedly accepted this grand announcement. At the time of this announcement there were Ulama and religious dignitaries from all over India and from other countries, such as from Pakistan, Bangladesh, Lanka, Africa, Zimbabwe, Holland and London. Numerous Mashaa’ikh of highly acclaimed Khanqahs and centres so learning were also present. 1. Sadrul Ulama Hazrat Allama Mufti Tehseen Raza Khan (Alaihir Rahmah), who is the grandson of Ustaz-e-Zaman Allama Hassan Raza Khan (Alaihir Rahmah). He was also famously known as Muhaddith-e-Bareilly. He was the Principal of Jami’atur Raza. 3. Bahrul Uloom Hazrat Allama Mufti Abdul Man’naan Saaheb A’zmi. He is a highly acclaimed teacher and Mufti. He is currently the Head of the Darul Ifta (Fatawa Dept.) at Shamsul Uloom in Ghousi (India). It must also be noted that after this announcement, Huzoor Taajush Shari'ah stood up and appointed Mumtazul Fuqaha, Hadrat Muhadith-e-Kabeer, Allama Zia ul Mustafa Al Qaadri as the Deputy Chief Justice and announced this appointment. Huzoor Taajush Shari'ah commanded Maulana Mohammed Shu’aib Raza Saaheb to explain the reason for this appointment further. Maulana Shu’aib Raza (out of modesty) requested Mufti Me’raj Al Qaadri to explain this. Thereafter, during the third Fiqh Seminar of the “Shar'i Council of India" when there were more than sixty highly accredited Ulama from numerous cities and states present, Muhaddith-e-Kabeer once again announced the appointment of Huzoor Taajush as Chief Justice. They all accepted him as the Chief Justice for the entire India without any objections. This is a great happiness for the Ahle Sunnat wa Jamaat, that the family of A'la Hadrat Imam Ahmed Raza (Alaihir Rahmah) has been continuing in this great service of the Islamic Judiciary. We make Du'a that Allah Ta'ala grants the Ahle Sunnat Wal Jamaat the blessings and guidance of Taajush Shari'ah to be with us and may this great Sufi and Scholar of Islam continue to inspire us with the true legacy of Imam Ahmed Raza (Alaihir Rahmah) and may he administer the affairs of the Deen with great Wisdom and firmness. Aameen.